Meetings held at the summons of the lord mayor of London by citizens of the English metropolis to protest against the persecution of the Jews. The first of these was held on July 3, 1840, to protest against the blood accusation brought against the Jews of Damascus. A demand for thismeeting was made by 210 important residents of the city. Speeches were delivered by Daniel O'Connell, Alderman Thompson, Dr. Bowring, and others, expressing their disbelief in the accusation and demanding the release of the accused. The resolutions of the meeting were sent by the lord mayor to the chief ambassadors of foreign powers residing in England, and an especially favorable reply was received from the Emperor of Russia. Over forty years later meetings were convened by the lord mayor of London to protest against the persecutions of the Jews in Russia. Attention had been called to these by articles in the London "Times" of Jan. 9 and 11, 1882, written by Joseph Jacobs, and a requisition was made for a Mansion House Meeting in consequence. The requisition was signed by thirty-eight persons, including the Archbishop of Canterbury, Cardinal Manning, Charles Darwin, John Tyndall, and eighteen members of Parliament. This meeting was followed by numerous others throughout the United Kingdom, including one at the University of Oxford. The requisition for the Guildhall Meeting of Dec. 10, 1890, was signed by eighty-three persons, again headed by the Archbishop of Canterbury and Cardinal Manning, and including nineteen peers, twenty-seven members of Parliament, and the foremost representatives of nearly every learned profession. 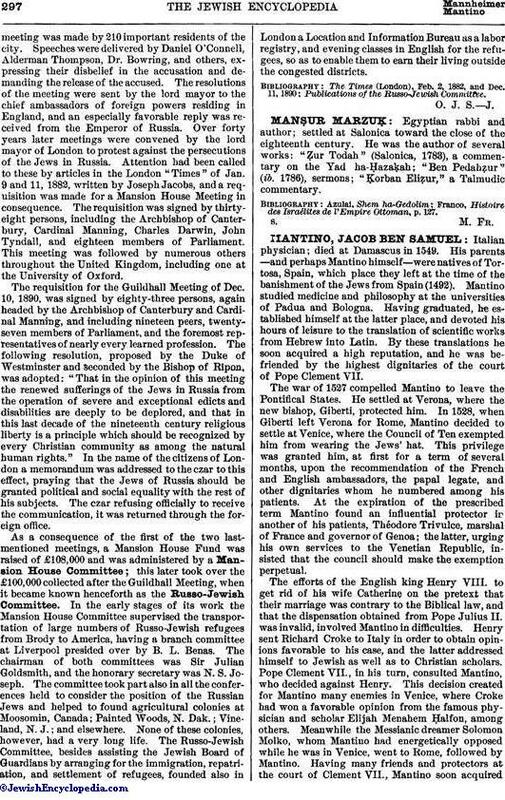 The following resolution, proposed by the Duke of Westminster and seconded by the Bishop of Ripon, was adopted: "That in the opinion of this meeting the renewed sufferings of the Jews in Russia from the operation of severe and exceptional edicts and disabilities are deeply to be deplored, and that in this last decade of the nineteenth century religious liberty is a principle which should be recognized by every Christian community as among the natural human rights." In the name of the citizens of London a memorandum was addressed to the czar to this effect, praying that the Jews of Russia should be granted political and social equality with the rest of his subjects. The czar refusing officially to receive the communication, it was returned through the foreign office. As a consequence of the first of the two last-mentioned meetings, a Mansion House Fund was raised of £108,000 and was administered by a Mansion House Committee; this later took over the £100,000 collected after the Guildhall Meeting, when it became known henceforth as the Russo-Jewish Committee. In the early stages of its work the Mansion House Committee supervised the transportation of large numbers of Russo-Jewish refugees from Brody to America, having a branch committee at Liverpool presided over by B. L. Benas. The chairman of both committees was Sir Julian Goldsmith, and the honorary secretary was N. S. Joseph. The committee took part also in all the conferences held to consider the position of the Russian Jews and helped to found agricultural colonies at Moosomin, Canada; Painted Woods, N. Dak. ; Vineland, N. J.; and elsewhere. None of these colonies, however, had a very long life. The Russo-Jewish Committee, besides assisting the Jewish Board of Guardians by arranging for the immigration, repatriation, and settlement of refugees, founded also in London a Location and Information Bureau as a labor registry, and evening classes in English for the refugees, so as to enable them to earn their living outside the congested districts. 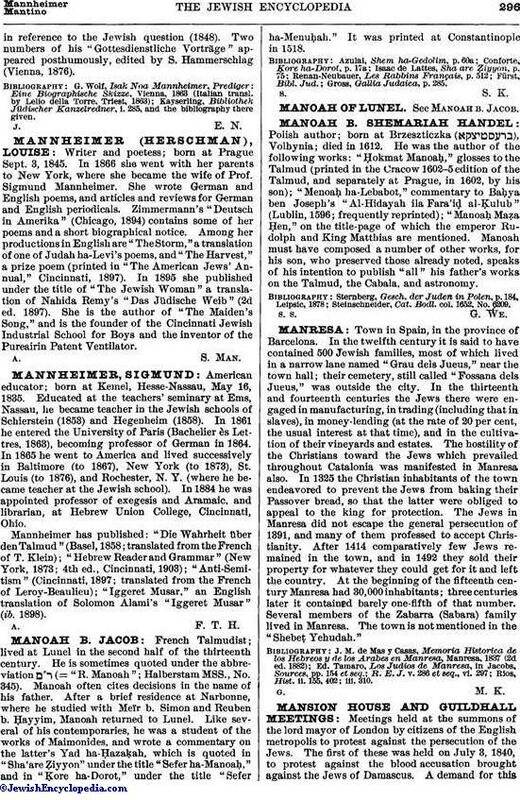 Publications of the Russo-Jewish Committee.